BEGINNINGS gives the instructor time and space to break down the poses and discuss alignment. It moves at a slower pace and is perfect for beginners, people with injuries, those recovering from illness, or anyone who is in the mood for a slower, more gentle class. You will learn sun salutations, warrior series, balancing postures, back bending and inversions in a safe environment. We keep it simple, but beginning does not mean easy! The focus of these classes is on building a framework for your yoga practice that includes constant, focused breathing and strong, safe poses with proper alignment. You’ll sweat, you may laugh, and you’ll grow as you learn the foundation of this empowering practice. DYNAMIC FLOW is a breath and alignment focused flow set to specially created playlists playlists to flow with the sequences. This class helps students build physical strength & flexibility as we move through energetic, challenging & creative sequences. We invite students to take a look at any challenges that may arise during class & notice the mind's reactions. This creates mental awareness, clarity & focus. Students are encouraged to tune into their own bodies, breath & thoughts to learn more about their habits & patterns. This information can then be taken off the mat & used in daily life. This class is appropriate for all levels. Modifications and variations are encouraged to support and accommodate individual needs and experience levels. KUNDALINI YOGA is the science of the human body with the purpose of awakening your full potential. It is the Yoga of Awareness, a powerful tool using breath work, eye-focus, mantra, body locks, and postures to balance the glandular system, strengthen the nervous system, expand lung capacity, and purify the blood. It shifts the nervous system from sympathetic mode (fight or flight) to the parasympathetic mode (rest), bringing balance to the mind, body, and soul. When you practice Kundalini, good things come your way. POWER FLOW is a powerful, sweaty class designed to challenge, awaken, detoxify & purify every system, muscle and tissue of the body. It will sculpt, tone and condition both your body and mind. This energetic flow is an invitation to reach your fullest potential & overcome the limitations you create in your life. With carefully curated playlists of energetic music, this class helps students get out of their heads & into their bodies by concentrating on body & breath awareness. This class guides students to face their fears & push themselves out of their comfort zone, while maintaining personal safety through awareness of their bodies. This leads to personal growth, transformation and empowerment. This class is appropriate for all levels. Modifications and variations are encouraged to support and accommodate individual needs and experience levels. PRE/POST NATAL YOGA is designed specifically for pregnancy. We will take time to connect with our growing babies and changing bodies through the breath and asana. The class will focus on strength and flexibility needed for pregnancy and birth, breathing for relaxation, and restoration. Come bond with other woman on the same journey to motherhood. This class is also open to women who have recently given birth & are interested in a yoga class that will help them in recovering from childbirth. We will focus on specific poses that will help strengthen your body and ease your mind post-birth. SLOFLOW YOGA takes the classic Vinyasa flow class & puts it in slow-mo. 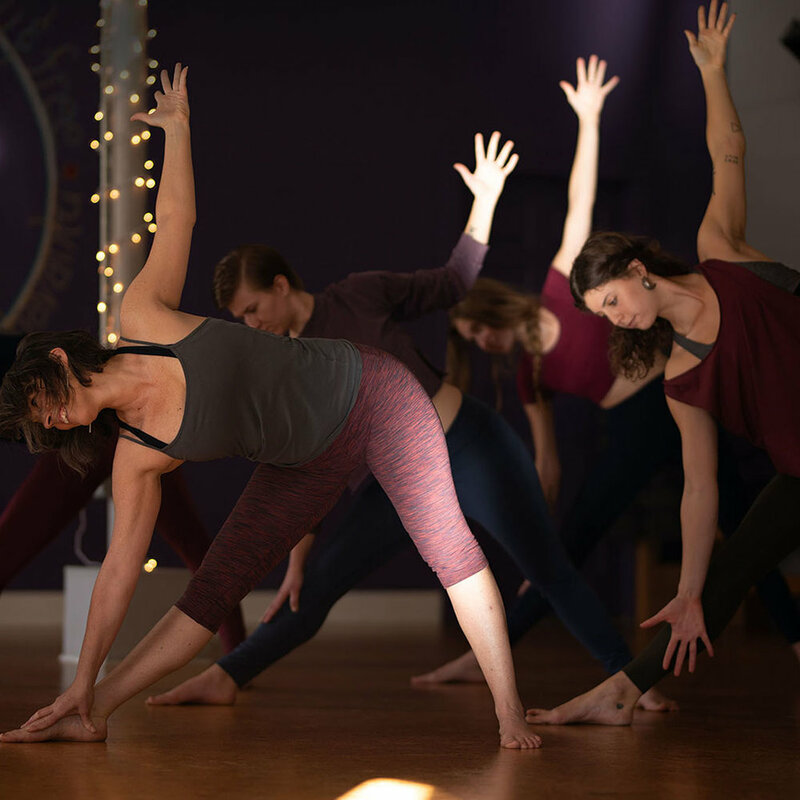 Enjoyable by beginners & advanced practitioners alike, SloFlow links classic postures, alignment, and deep breathing with creative sequencing and inspired tunes for a practice that will help you grow both strong and flexible in your practice. Through mindful movement and postures infused by the breath, expect a practice that will leave you more balanced & at ease than when you arrived. YIN YOGA is a deeply moving practice that promotes relaxation & surrender. It is a fantastic balance to the the heat-building, strength-based, “yang” yoga that is found through a typical Vinyasa practice. Yin utilizes long holds of gentle floor postures to increase joint health, tissue elasticity, and overall mobility. This practice eases the nervous system and is restorative in nature. Leave with a deep sense of calm & bliss!